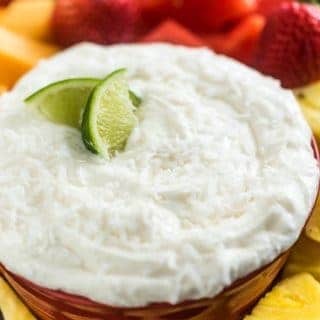 Coconut Lime Cream Cheese Fruit Dip-- The Best Fruit Dip Ever, promise! This cream cheese fruit dip will have everyone coming back for seconds! It’s cool and creamy with big flavor and is perfect for dunking fresh cut fruit in for a delicious summer treat. Happy Monday, friends! It’s summer and I’m pretty sure I could keep myself sustained by eating watermelon and kettle corn for the next three months. 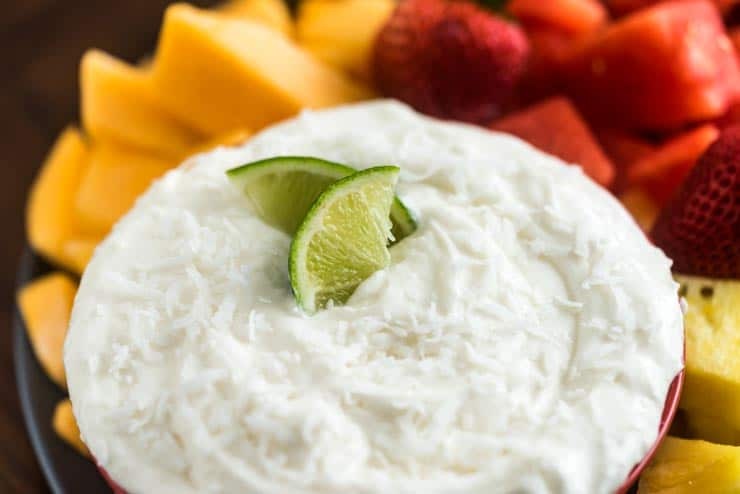 I may have to throw some copycat Chipotle Guacamole in here and there, but for the most part, watermelon is my BBF right now… especially when I take the time to make this coconut lime cream cheese fruit dip recipe. I know, cream cheese fruit dip isn’t exactly a new idea, but this recipe takes the classic fruit dip to a whole new level. 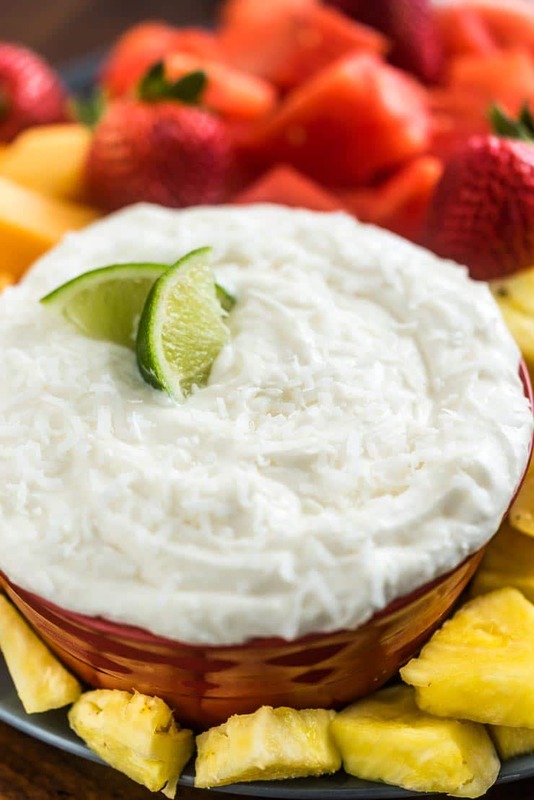 The key ingredient here is Cream of Coconut and it gives the dip a rich coconut flavor and sweetness that is incredible with all kinds of fruits. Cream of Coconut is basically coconut’s version of Sweetened Condensed Milk. 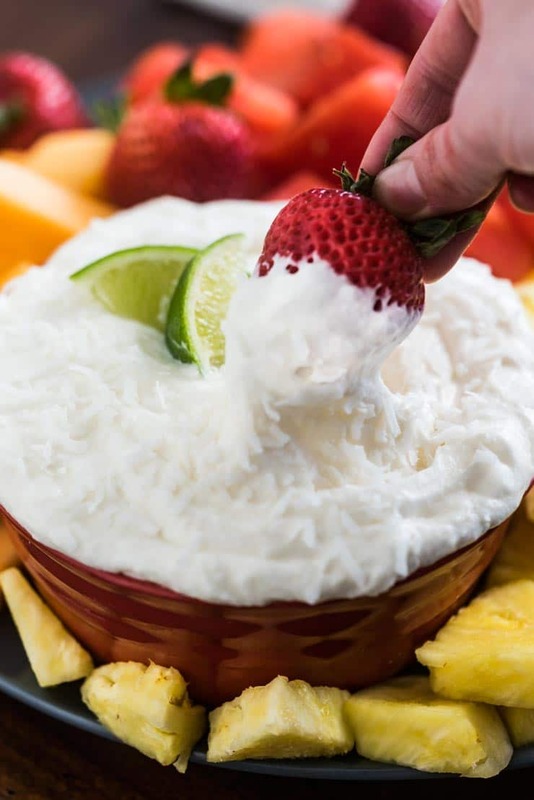 It’s concentrated coconut milk mixed with a high volume of sugar and is typically used for making mixed drinks and ice cream where you need lots of sweetness and coconut flavor– which makes it great for this fruit dip! For the creamiest fruit dip with no lumps of cream cheese, make sure your cream cheese is very soft and not cold at all. Add the cream of coconut slowly, mixing and scraping the bowl between each addition to make sure all the cream cheese is combined well with the other ingredients before adding more. Fold the whipped topping into the final dip gently so it stays as fluffy as possible. Yes! Make this dip up to a few days before you’re ready to serve. How Long Does Fruit Dip Last? Not long enough in my fridge! You can expect it to last about one week in the fridge stored in an airtime container. Well, it’s made with cream cheese, marshmallow cream, sweetened condensed coconut milk and cool whip, so you be the judge. Is it beneficial to your mental well-being? YES! 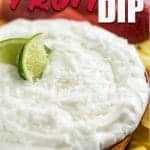 What Fruit Should I Dip in Fruit Dip? I’m not gonna lie, I would (and have) eaten this dip with a spoon. But, if you’re looking for some fruit recommendations, here are my favorites that are sturdy and can withstand some serious dipping. This cream cheese fruit dip will have everyone coming back for seconds! It's cool and creamy with big flavor and is perfect for dunking cut fruit in for a fresh summer treat. 15 ounces cream of coconut --NOT coconut milk-- This is found in the drink mixer aisle. Mix cream cheese in a medium-sized bowl with an electric mixer until very soft and smooth. Slowly mix cream of coconut into the cream cheese, beating until smooth, followed by the lime juice. Mix marshmallow cream into the mixture until smooth. Using a spatula, fold whipped topping into the dip until fully combined. Refrigerate dip for at least 1 hour before serving to allow it to thicken. Garnish with shredded coconut and lime wedges if desired. 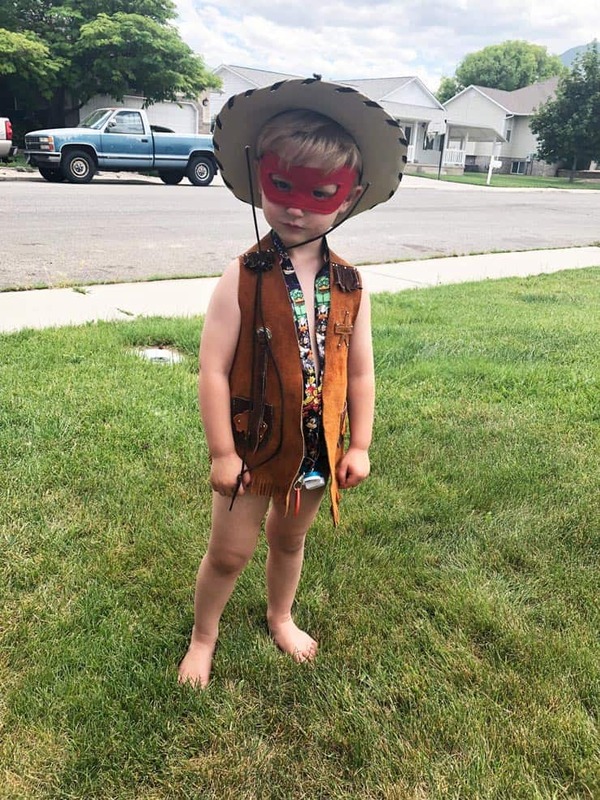 This guy decided to go out for a toddler Village People cover band upon hitting the ripe age of 4. We celebrated with lots of cake and a talk about how your clothing choices affect how others perceive you. He took it well, I think. 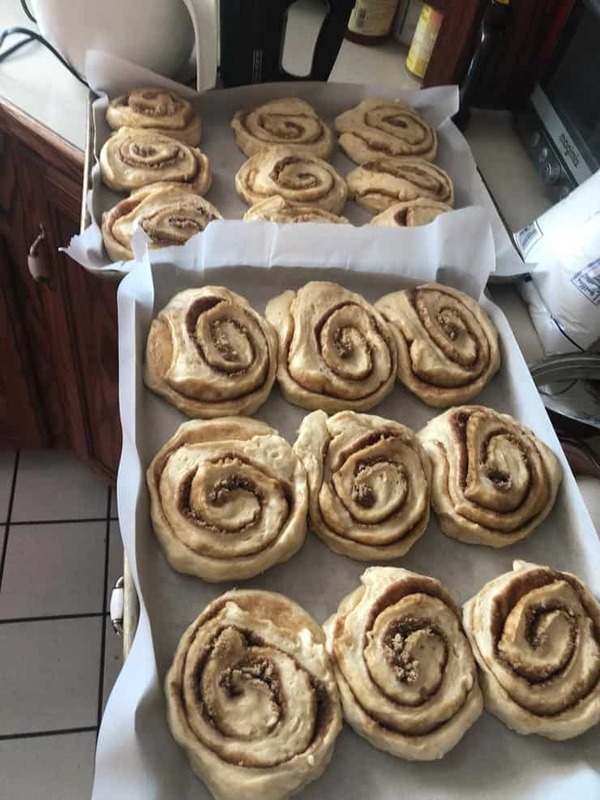 I managed to make ridiculously-sized cinnamon rolls for a daddy-daughter breakfast this last weekend. You know they are too big when full-grown men can’t finish one. This is it what they looked like before they had their second rise and bake, so use your imagination. 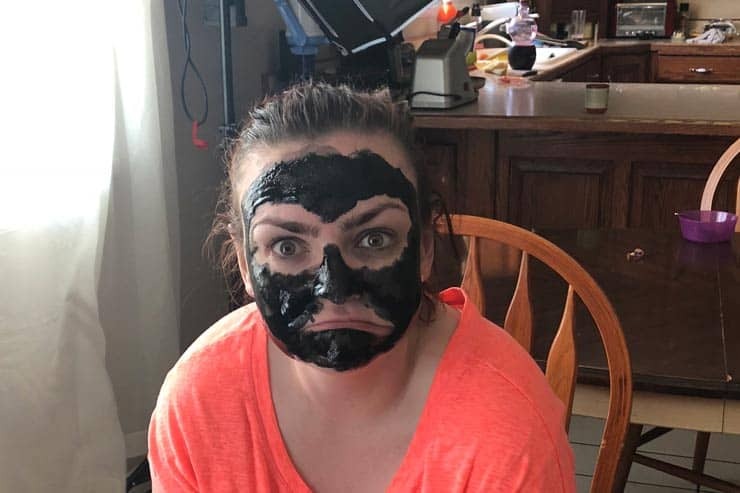 My girls gave me a “spa” day and took, what might be, the most disturbing picture of me ever. I use the term “spa” loosely as it mostly consisted of them laughing as they peeled the mask off my face and watched me squirm in pain.